The ultimate guide to Borovets ski holidays in 2019 & 2020. In Borovets, Bulgaria’s oldest ski resort, you’ll find a ski destination with the ability to transform from a historic village steeped in culture by day, to a booming party capital by night. Ski on deep, fresh powder at the top of the Mount Musala before making your way back to the charming village, meandering through pine forests, and you’ll understand why Borovets keeps bringing people back. 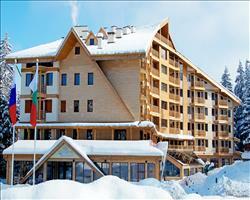 Do you dream of skiing down the same mountains where Bulgarian Kings of old once hunted? Oh, right. Just us then. Well how about a ski holiday at a snip of the price you’d pay in France or Switzerland, with exhilarating views, booming après ski and large doses of sunshine? That’s more like it. Here in Borovets you’ll experience a resort steeped in tradition and culture, and of course the fantastic skiing opportunities you’d expect to find at Bulgaria’s 1st ski region. In the charming village centre you’ll be welcomed with open arms and gleaming smiles into one of many cosy taverns or lively bars. With incredible views of the Rila mountain range and enchanting forests surrounding the village, it’s no wonder it’s all smiles here in Bulgaria! The resort itself is smaller than the up-and-coming Bansko, giving the whole place a cosy vibe, which is added to by the surprising lack of crowds. We might not be painting the prettiest of pictures for any party animals out there, but have no fear! The village centre comes alive soon after the night skiing is finished and families have retired to their hotels, leaving you free to hop from happy hour to happy hour! Borovets is a short hour and half drive from Sofia airport, and with no shortage of transfer possibilities you’ll on the slopes before you can say Sitnyakovo, Yastrebetz, Markoudjik. In case you were wondering, those odd looking words are in fact the names of the 3 ski centres that the resort is broken up into, all easily reachable from the village using Borovets’ efficient lift system. The Borovets ski pass entitles you to access to all 3 of these fantastic areas, and thanks to its great value for money, a nice bit of cash left over to spend on some all important ski gear and Bulgarian beer! View our detailed Borovets snow forecast or snow report and see all live webcams, piste maps, road and travel maps and lift pass prices. For a picture of historic snow conditions see the snow depths month by month with our Borovets snow history. Young skiers will love Borokids Park, where the magic carpet, carousel can help them get to grips with the snow. The message to beginners from the lovely people at Borovets’ Chili Peppers bar is ‘more beer = less fear!’ however we’d highly advise against skiing under the influence, and instead suggest lessons with one of the local ski schools like Hunters and Yanakiev and the Sitnyakovo Royal Residence Ski Way’s wide, gentle slope for some cruisey confidence building. Each of the 3 ski areas offer intermediates something a little different. The Yastrebetz is home to long winding slopes, including the lengthy Yastrebetz 1, which snakes its way through pine trees back to the resort. Venture a little further up and you’ll find the Markoudjik area, along with its characteristic shorter, zigzagging slopes, not to mention the incredible views and deep powder. Lastly we have the Sitnyakovo centre, which offers intermediates a few short reds like the Martinovi Baraki 2, and the chance to chill out with some easy returns to the village. Hardened experts may not be challenged here, but that’s not to say they won’t enjoy the fresh powder up on the petite Markoudjik 2A, or the steep, sharp Fonfon slope under the Yastrebetz lift. Unfortunately, Borovets does still have a few draglifts kicking about, but boarders are more than compensated for this in the fantastic Snowpark at Yastrebetz 3, with the half-pipe, as well as some super jumps and rollers. Great powder up in the Markoudjik area is also welcome news for freeriders and you’ll do well to say no to a night time return back through tree-lined pistes. In spite of Bansko’s up and coming popularity, Borovets remains the party capital of Bulgarian ski resorts, with vibrant nightlife guaranteed as soon as you’re off the slopes. The ever friendly bar hosts at places like Bobby’s and Samokov offer unbelievably cheap local beer, and once the Bulgarian Rakia shots start flowing, you’ll understand why people are back in Borovets year after year. 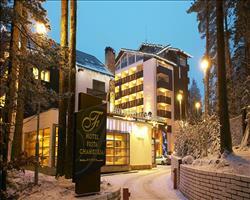 However, in spite of the après ski festivities, Borovets is far from just another ‘lads holiday’ ski destination. Instead, the country’s oldest ski resort lets a little of the party atmosphere spill over into its rich culture, paving the way for lively Bulgarian folklore nights, all of course accompanied with fantastic food. Borovets has restaurants to cater to all tastes, whether you fancy a nice juicy steak cooked to perfection at the Golden Horn, a little taste of Italy at The Crown, or if you’re feeling adventurous, the wild boar stew at Villa Park Restaurant. Aside from barhopping and sampling fine food in all Borovets restaurants, non-skiers will find plenty of great activities here too. There are day trips to Sofia or Plovdiv, or for something a little closer to home, excursions to the magnificent Rila monastery, a fortress steeped in ancient history. 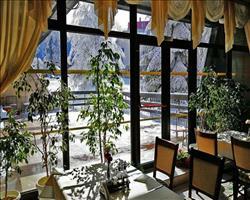 There are trips available to Rila every day after ski lessons, should any skiers fancy an afternoon off the slopes. If you are still keen to be on the snow, but without skis, renting a skidoo (snowmobile, if you like) will certainly get your adrenaline flowing! Whatever you choose to do during the day, make sure you stand back and watch in awe at the instructors’ nighttime shows, including big jumps and silky tricks. If seeing them doesn’t want to make you take up skiing, we don’t know what will! 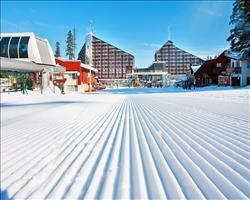 When is the best time to ski Borovets? 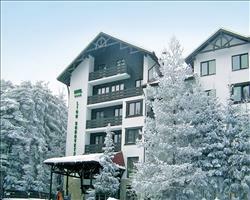 Borovets has the good fortune of a nice high altitude, the highest point at 2560m, to be more precise. This means snow conditions here are usually very good, especially so in Markoudjik, the highest of Borovets’ 3 ski centres. The remaining two centres get a helping hand from some great snow making technology, ensuring pristine pistes and smooth sailing all the way down. 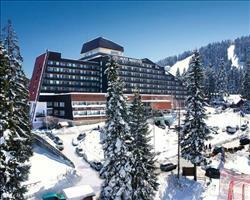 With Bulgaria boasting Europe’s sunniest pistes, the best time to ski is peak season (between Jan and Feb). Should the snow not quite last throughout the day towards the end of the ski season, just get up nice and early to take advantage of the best conditions, then kick back with a beer and top up your tan, or soak in some of the rich culture. Here in Borovets, you’ll get all the ski schools and blue slopes you’d expect to find in France or Switzerland for a fraction of the price, making it a great choice for a family holiday without having to break the bank. If your kids (or you for that matter) can’t wait to get on the snow every morning then accommodation with doorstep skiing is an ideal choice. 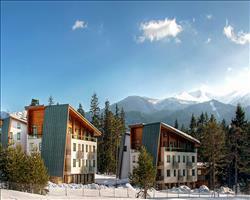 You’ll find ski-in ski-out facilities at the cosy Villa Alpin and the Hotel Yanakiev to name but a few. Many of our other options are within a minute’s walk from the lifts and the resort centre, so you and your loved ones won’t have to deal with that dreaded arctic trek with your skis every morning! If you’re taking the little ones away for their first taste of skiing, Borovets’ schools, like Hunters and Snow Masters, have years of experience between them, so you’ll know they’ll be in safe hands and having a great time on the magic carpet. Alternatively, if you wanted to see their faces light up first hand, then a private family instruction ski day is ideal, whilst slightly older beginners will be cruising down long gentle blues (they’ll love the Sitnyakovo Royal Residence slope) in no time. Aside from the skiing, there are historic sites and breath-taking views aplenty, not to mention some fantastic food. And as if that’s not enough, your kids will marvel in awe as their instructors from their morning ski class take to the floodlit jumps and show off their best flicks and tricks! If you want to get the best deal, and sit back and look forward to your holiday, book our package including flights transfers and your choice of accommodation, however if you’re planning on independent travel or self-drive, we still have some great deals for you! As Bulgaria’s oldest ski resort, Borovets has amassed years of experience in accommodating groups, making it as good a choice as any for a holiday with friends and family. Equally as important as the skiing and activities here, is having a place to stay that keeps everyone happy, and Borovets certainly doesn’t disappoint. 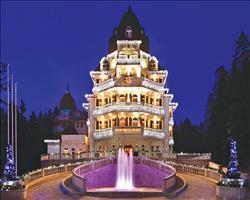 State-of-the-art luxury hotels like the Winter Palace and Hotel Lion are sure-fire hits, with everything you could want and more from a hotel. Or if you’d rather spend a little less and have more to spend on wild nights out (not that you’ll need much here! 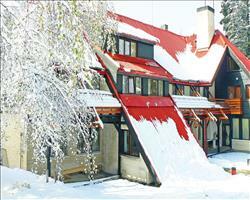 ), Iglika Apartments, Yagoda Village Chalets and many more provide great value for money. 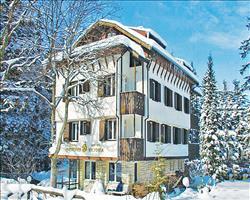 Catering for skiers of all standards can often pose a problem when booking a group holiday. In Borovets you’ll find no such dilemmas; absolute beginners can get to grips with the slopes with the Hunter or Snow Masters ski schools, whilst advanced skiers can carve up powder high up in the Markoudjik, or refine some skills in the Borosport Snowpark. No non-skiers will be blamed for coming out here just for the incredible views, historic sites and nightlife... but should you get jealous of the skiers re-telling their stories of the wind rushing past them as they hurtle down the slopes, rent a snowmobile and have some excitement of your own! Now we all know booking a group holiday can be tricky, particularly for a large group or if there are a few stragglers tagging along. So do yourself a favour and book a package including flights transfers and accommodation and we’ll do all the hard work for you (not to mention saving you a bundle!). Alternatively if you do decide to take on organising independent travel or a self-drive trip for the group, we’re more than happy to help you out with some great accommodation deals. I can’t fault Borovets and will definitely ski here again. I’d without a doubt recommend it to anyone who wants to learn and anyone else really! We had no problems whatsoever with the journey here - flew into the main airport, Sophia International, which is a very modern airport and got on the coach to the resort with no problems. From Sophia to Borovets took about 1 hour 15 - 1 hour 20 minutes. The people in the resort are so friendly and they couldn’t do enough for you. There are lots of lads when you walk up and down the high street who try and get you into the restaurants, offering you free drinks etc, we ended up getting to know one lad who called himself Diamond and really looked after us throughout the week. Borovets is the oldest resort in Bulgaria, it’s a little shanty town and is all lit up at night in all different colours. Unlike other ski resorts, it’s a really lovely place to be in the evenings with plenty of restaurants, shops open and lots to do – the night skiing was amazing. I enjoyed Bulgaria more than Austria, I’ve been to places like Neiderau and Mayrhofen and the snow conditions are better. The snow was very good in January but if I go back I’ll probably look at mid to end of February as they have a later season and that’s when the best snow is. The lifts can be a lot busier at times but it depends on the time of year, and that’s the same as any resort. Apparently in the next couple of years they’ll be spending a lot of money to improve it even more. Borovets was nice! You get bartered to come into the restaurants and bars a bit, but overall it was ok. It’s a good resort for beginners. Definitely, no matter who you are, go to Bobby’s Bar. It’s amazing for families, young people, everyone. We ate there pretty much all week; they do all sorts of food and it’s really good and well-priced. We didn’t do many other things, it was near the end of the season and things like snowmobiling were at a standstill. "A lively resort, great for beginners"
I was learning to ski and it was great for me. The snow was ok but it was coming to the end of the season. I think it’s great for everyone, all levels, but advanced skiers probably want to go there when the snow is better. It is varied, there are blacks and harder runs for the better skiers. There’s plenty to do other than skiing. They offer trips, for example you can go out with a skidoo. The town is lively. There are plenty of bars offering quiz nights and such like. Buzz Bar was good, and we went to the Red Lion pub a bit, and then there was BJ’s right on the corner (don’t laugh) which had music and sky sports and happy hours. The drinks were quite cheap. 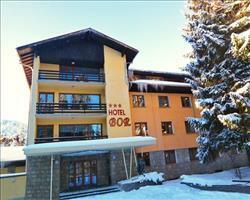 "Brilliant half term in Borovets"
We had a brilliant week in Borovets. It was half term and there were a lot of families there but we didn’t experience any queuing for lifts. The weather was good (5/6 days of clear blue skies) and the snow was amazing. The skiing’s really good, with a lot of nice, wide and quiet runs. If you were a super skier after loads of challenging black runs it might not be the resort for you, but for a week of family fun it’s great. The area’s self-contained so you couldn’t find yourself 3 valleys away and missing the last lift back, which meant the kids could go off on their own. All in all a great week. The snow was pretty good while we were here – we were mostly boarders and a few skiers and the terrain was fine with varied slopes and a lot of beginner-ish terrain. Borovets’ nightlife is good fun but it was annoying having all the club reps hassling you to go into their bars when you’ll probably end up there at some point in the week anyway... It’s not a particularly family friendly resort but for a young group of lads on holiday it’s great. Everything’s really cheap and every bar you go into you get free shots. 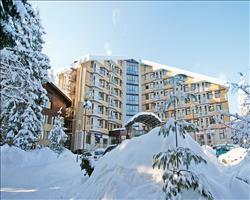 "I would go back if I went skiing in Bulgaria again"
I would rate this resort as very good. Literally everyone speaks English, all the staff, everyone. There are loads of English people who go there, so I wouldn’t come here if you want a particularly foreign experience. In terms of difficulty I would rate it difficult enough. There’s not really enough to do for very, very advanced skiers but there are enough difficult slopes to keep even the better skiers happy. It’s a decent size. There are quite of few groups of children. 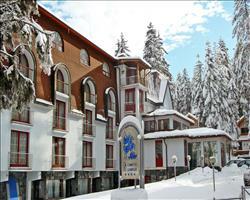 I think it must be in the top 3 resorts in Bulgaria - I would go back if I went skiing in Bulgaria again. "Been here loads, good beginner resort, Bobby's bar is great"
I've been coming here for years as I have a friend who lives here. 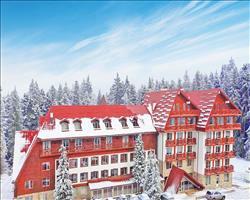 Borovets isn’t very big and hasn’t got the infrastructure of resorts in France. If you’re a beginner going skiing for the 1st time, it’s a good starter place but if you’ve been to France and Austria and then go to Bulgaria, you might be disappointed. The ski area is beginner-intermediate, there are only 2 black runs I can think of and even those aren’t that challenging. I always book last minute because the biggest problem is making sure there’s enough snow there. The best time of year is usually early Feb – March, but even at the beginning of February this year we were quite limited to only a couple of runs that had snow machines on. The whole village is half a mile, it’s set around three roads that form a triangle and you could probably walk around the whole place in 10 minutes. It’s not a huge place but there are clubs, restaurants and bars. A lot of the restaurants are traditional Bulgarian and like with any ski resort, any place on the mountain will cost twice as much. Check out Bobby’s Bar – Kas is English and her husband is Bulgarian, they have a kids club and the food is really good there. Just make sure you don’t do something wrong or you’ll have to do a punishment shot of their own particular brand of rakia! You can get a taxi into Samakov town (which takes about minutes) which is worth doing for something different. I enjoyed my first trip to Borovets, I was lucky to have good snow conditions in January, and the people there were friendly. I suspect it wouldn’t appeal to really experienced skiers, but that’s not my level anyway so I was fine. First place I ever went skiing- it gave me the bug. Family friendly and very picturesque, I remember the the horse drawn carriages and tree lined cobble roads making it a wondrous place as a child. The beginner runs were entertaining, mostly snowed over roads which for a kid, you didn't have any fear about blasting round them while the instructor screamed 'SNOWPLOW!!!!' Would definitely like to go back since skiing it 10 years ago.